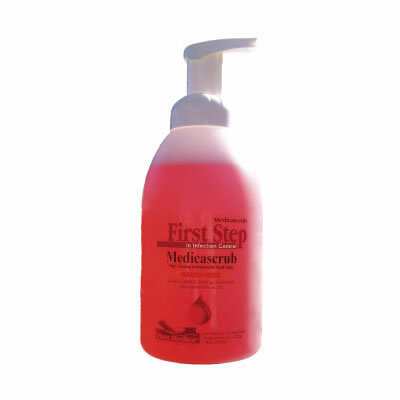 MedicaScrub contains aloe vera, lanolin, and vitamin E to nourish hands and keep skin soft and moist. With MedicaScrub, there is no itchy, dry skin or harsh odor. The fresh mango scent and rich, foamy lather make MedicaScrub pleasant to use. MedicaScrub is effective against E coli, Staphylococcus aureus, and Serratia marcescens. Its high-foaming dispenser produces a rich, foamy lather. Aloe Vera, lanolin, and vitamin E can keep skin soft and moist. A fresh mango scent makes MedicaScrub preasant to use even with frequent washings. According to First Medica, dry, itchy skin and harsh odors from chemical soaps can be eliminated when MedicaScrub is used.